Don’t take our word for it – Take theirs! 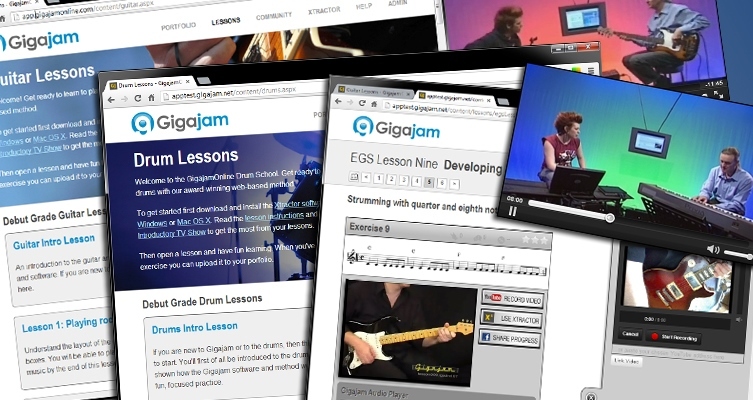 If you are looking for an affordable way to learn guitar, bass, keyboard and/or drums then consider what some of our wonderful users think and say about their own experiences of Gigajam. 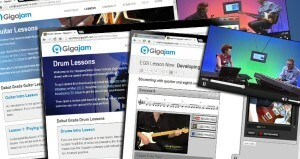 My experience of Gigajam is one that encompasses many learning styles, right from the written word to videos to practical application. It covers everyone’s preferences for learning and that is rare. I love that I can go to it whenever is convenient, I am not restricted to specific lesson times and I can carry on if I am in the zone or stop if I am tired or distracted. The flexibility is marvellous. I love this way of learning a musical instrument and would recommend it to everyone. It’s not conventional but when did ‘conventional’ ever move the world forward? I love the structure and the simplicity of the learning process. Gigajam is a great opportunity for self-study in any age. Being busy in a full time job I needed something that I could take at my own pace, was systematic in it’s approach and gave me immediate feedback on what I was doing. Gigajam did all this and fitted in with my approach at that time which was to play keyboard via MIDI and use virtual instruments. Another useful aspect of the approach was that I often had periods away on business so needed to revise some parts. The modular structure allows this and the new format based on line is brilliant. I found the Gigajam system totally fascinating. First there was the personal touch: nice to see who I was dealing with in the introductory videos, comments via portfolio, e-mails when necessary, and constant encouragement leading to a sense of achievement. Then the magic of Xtractor, giving such precise analysis of every single note. And the totally new experience of playing along with other instruments – great! The course is brilliant and for the price is unbeatable. I chose Gigajam because I was looking for a structured progressive lesson program which was inexpensive and I could use when I have the time. I did not want to commit to a more expensive program only to find out later that it was not the one for me or I ran out of time to fully use it. The bite sized lessons enable anyone to easily progress from one to the other without realising the actual progress made. Once you do realise that, you want to push harder, pick up the pace and take on the next challenge. I look forward to the marking results and feedback to know that I have achieved the next level and this encourages me to push on to the next level as quickly as possible. Thank you Gigajam joining was one of the best moves I have made. You have helped me to achieve a long held ambition to play music in my own environment in my own time with no pressure. Fantastic! I have always loved music and have always wanted to learn an instrument, but due to life’s hectic schedule never seemed to get around to it. I have bought a few books in the past but never found one that could, teach me the skills that were required past basic tunes in C! I am enjoying the process, and would recommend to anyone who hasn’t the money or inclination to take face to face lessons. I have really enjoyed using the website. The lessons and tutors are excellent and seem to ease you into reading music and getting to know the instrument quite effortlessly. I also liked adding performances to my portfolio and having something to show my progression through the course. Apart from the pleasure that learning a new skill naturally gives, as well as being very frustrating at times, I look forward to receiving feedback on my video uploads. I feel it gives me some comfort that I’m making some progress and heading in the right direction. I guess there is no substitute for one to one tuition but my lifestyle at the moment doesn’t fit perfectly with this method and I do believe I have found the next best thing. It has an element of personal interaction that I like and actually receiving this feedback request email from you did make me smile, there really is a person on “the other side”. I have found the lessons and steps to learning simple to follow and all in bite size chunks. You can repeat your lesson as much as you need to (in my case loads of times). What’s nice is the instant feedback from the scoring system, Xtractor. So you can really see how much progress you’re making. Gigajam has been a blessing. It has given me the affordable opportunity to learn the keyboard at my own pace . Now, I have a little bit more insight into the language of music. I’ve been a member for about three or four years but I still get phenomenal pleasure from playing on Gigajam. I really enjoy using ‘Extractor’ and trying to get into the rhythm. I practise the piano daily but use ‘Gigajam’ as a session when I hook up to my computer. It makes the music come alive and has given me incentive to keep at it. I also like the comments you make as it adds a nice personal touch and is encouraging. Thank you so much for your program, I tell all my friends about it. I like the progression that is built in to the course where we start by learning how to play with one hand and playing simple chords, building up to scales, through using two hands and eventually playing melodies. I think the “overview” video at the beginning of each lesson to show where we as students are going and how we are going to get there is a very good idea. The lesson notes that accompany each lesson are very well written, very clear and are superbly presented. Each lesson is broken down into small, easy to comprehend chunks. I feel that I have achieved something once I have completed a “chunk” even if I haven’t completed a lesson. I particularly like the layout of each lesson. The video clips show the desired end result, the print shows the theory of what it is that we are trying to achieve and there are the tips to show how to achieve the target more easily. Gigajam Xtractor software is exceptional in the way that it enables the student to assess himself almost immediately. Achieving over 80% to get a three star result is both challenging and rewarding. I love the fact that i can fit in my learning at times to suit me, it’s a real plus, that I can get access 24 hours a day. It is a much cheaper way to learn music. I like Gigajam’s Xtractor, as it is like playing along with other instruments as if there are other band members joining in. I am currently learning keyboard, but I want to do the drumming course as well. I really rate the fact that you can analyse your playing with Xtractor. You get a percentage score so you can see if you are improving and making progress. It also shows you where you are getting things wrong. It helps tighten up your playing. The fact that you give feedback and encouragement is always a plus.